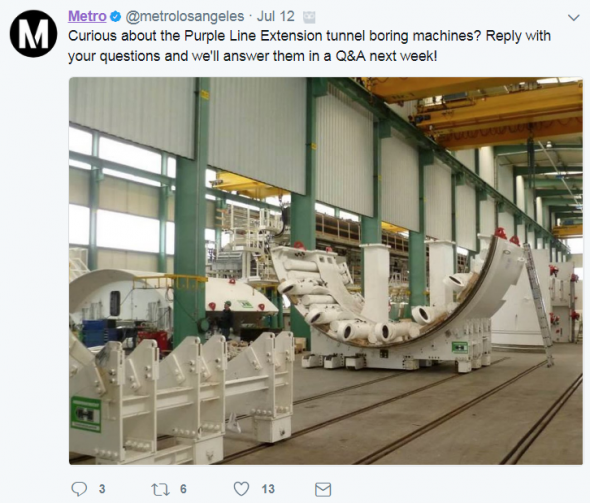 On July 12th, @metrolosangeles used Twitter to crowdsource questions about the two tunnel boring machines (TBMs) that are currently being manufactured and will dig the tunnels for the Purple Line Extension’s first section. Reed Alvarado @Reed_Alvarado: Do they have a start date for boring to begin? 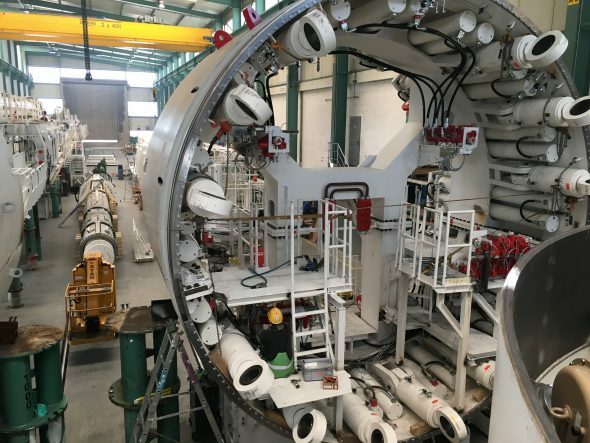 The TBMs are currently being manufactured by Herrenknecht in Schwanau, Germany — the firm is one of the world’s leaders in tunneling technology. The TBMs are anticipated to arrive in Los Angeles toward the end of 2017 and are expected to start work next year after they have been assembled and tested. 0ntir @0ntir: Do they, unlike those which drilled the UK’s Chunnel, have a “reverse” drive? The TBMs that will bore the tunnels for the Purple Line Extension do not have a reverse gear. Even if they did, the machines could not back up. This is because they place concrete rings behind them. The circle formed by these rings is smaller in diameter than the TBM itself. LA Denizen @LA_Denizen: What happens if it hits a methane pocket? Fortunately, methane needs precise conditions to explode. The physics of an explosion requires that the methane/oxygen ratio be in a specific range and a source of ignition (a spark of some kind). If the mix is too lean or too rich or there is no spark, the gas will not explode. 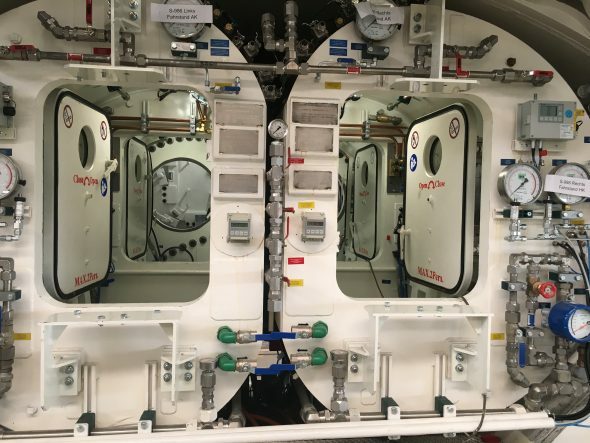 Sixty to ninety feet under the surface there is no air in the soil, other than the small amount in the TBM’s mixing chamber, and there are no ignition sources in the chamber, therefore the potential for an explosion in front of the TBM is prevented through engineering controls. Colin Parent @ColinParent: Do they have fun names yet? The TBMs are currently referred to as S986 and S987. An art and naming contest will be launched in early fall 2017 to give the Purple Line TBMs proper names before they begin their journey through the earth. Angie Stewart @Usual_Anomaly: What happens to the material you excavate? Is it all dirt? The truth is, you never know what you will find under there. However, since the TBMs will always bore at least 20 feet under the subsurface water table they’re expected to run into two major types of geological formations, which are known as San Pedro and Fernando. The excavated material will be trucked off-site for recycling if possible. We’re always looking forward to satisfying our inquisitive audience, so here are some more interesting facts about the Purple Line TBMs. Size: the TBMs are about 400 feet long — or the length of 10 school buses for perspective. The cutter head measures 21 ½ feet in diameter. This is big but not as big as Seattle’s Bertha which is a gigantic 57 feet in diameter (and is digging for a road project). Each TBM will weigh about 1,000 tons. They’re as heavy as 167 wooly mammoths, a typical male woolly mammoth weighs approximately six tons! The path: The TBMs will dig side by side starting at Wilshire/La Brea in the Miracle Mile section of Los Angeles and continue toward Wilshire/Western in Koreatown. Then they will be disassembled for transporting back to Wilshire/La Brea and then reassembled for the last leg of their journey through Wilshire/Fairfax and finishing at Wilshire/La Cienega in Beverly Hills. The TBMs will be digging up to 60 feet per day to create the 3.9 miles of new subway in Los Angeles and Beverly Hills. What’s that? : Noise and vibration levels are not expected to be perceptible. Even imperceptible levels of noise or vibration will be captured and evaluated by engineers through an array of monitors placed along the project alignment. From time to time, the public near the tunnel entrance may hear the sound of a horn — similar to that of a car — that is used as a safety signal and cautionary measure to alert construction crews of a service train entering or exiting the tunnel. This can happen as frequently as every hour. Willthe two machines be stored and used for the next two phases to Westwood? To expand on that question, will there be a stop at West Los Angeles Veterans Affairs Hospital? Yes, the station will be on Wilshire Boulevard, very close to the medical center. Why can’t the tunneling devices used for the Crenshaw line and/or downtown connector tunnels be reused? Why not use the TBM from the Crenshaw line or Regional Connector when done? TBM machines are purchased by the general contractor for each project. In each of these projects (Purple/Crenshaw/Regional) the general contractor is not simply just one company but rather a joint venture of 2 or more companies. These joint ventures operate almost as their own independent company. When purchasing construction equipment the joint ventures buy brand new equipment. This in order to then sell equipment at the completion of the project and split the money equally depending on each companies individual stakes within the joint venture. This correctly captures the deprecation cost of the equipment through the life of the project. How fast can a tunnel boring machine drill? The TBMs can tunnel at a speed of 60 feet per day each. So about a snail’s pace! TBMs are built specifically to tunnel through the ground conditions of the project area, so often they cannot be reused in another area. For example, one machine may be built to tunnel through tarry soils and can’t tunnel through harder, rocky conditions. The Regional Connector TBM Angeli was rebuilt so when there are opportunities to reuse TBMs Metro does upcycle. Additionally, since we don’t have a specialized industry that supports tunnel boring machine technology in America, these machines have to be assembled in Germany, so often starting fresh can be more effective in terms of time and money because TBM parts do have a short life expectancy due to the laborious nature of their work. Also, I’d guess that the sizes of the tunnels’ cross sections would be different for light rail vehicles (Crenshaw Line/Regional Connector) and heavy rail vehicles (Purple Line)? The sizes of the tunnels are actually about the same size for Metro’s 3 major rail projects regardless of light vs. heavy rail. Curious why you’ll be tunneling from La Brea/Wilshire to Wilshire/Western and then disassembling the TBM and reassembling back at La Brea? Why not start at Wilshire/Western and work your way west? Great question! The decision to start the TBMs at La Brea rested in real estate. There is just not enough room at the Wilshire/Western to accommodate the amount of material that must be stored and the systems necessary for a tunnel boring operation. We need space to store for excavated material, access roads for trucks, mechanical and electrical repair shops and more!